For some this will mean purchasing xylitol-sweetened products, such as chewing gum, candy, mints, etc... that can be conveniently consumed throughout the day. Others may prefer to just add xylitol in granular form to the foods and beverages they already plan to consume. Or if you prefer, you don't even have to ingest xylitol for it to be effective. The only requirement is that it's in your mouth. So if you prefer to create your exposure by using products like oral rinses or toothpaste, that's just fine too. One way incorporate xylitol into your diet is by purchasing it in granular form. It doesn't taste precisely like table sugar (sucrose) but you'll like it. It has no aftertaste. It looks very similar to regular sugar and it's used in the same quantities to sweeten things (foods, beverages). It can be used as a sugar substitute in recipes (except those where it's needed for yeast to rise). Xylitol only contains 2.4 calories (kilocalories) per gram whereas sucrose has 3.87. That's about 1/3rd less. 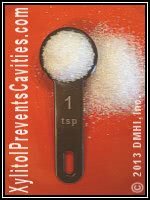 Most adults only need about 2 teaspoons of xylitol per day. It's usually sold prepackaged in 1 and 2.5 pound quantities. You'll find that it costs 3 to 5 times more than regular sugar (possibly even more considering sugar is often on sale). But that seems a small price to pay considering all of the benefits that it provides and how little you need to use to get them. While just finding products that contain xylitol can be difficult enough, locating those that have it in relatively high levels can be even harder. The remainder of this page describes ways that can be used to identify those products that do. The xylitol products we've seen typically fall within one of two categories. These are those products made by companies whose targeted customers could be described as "informed consumers." Their xylitol content is typically clearly documented right on their packaging. Some companies have taken notice of the growing demand for xylitol-sweetened consumables and have added them to their product line so not to miss a sale. In some instances, the quantity of xylitol these products contain is low. That's because xylitol is fairly expensive in comparison to other sweeteners and inferior manufacturers will skimp on it in favor of cheaper alternatives (especially sorbitol and manitol). One serving of this gum (two pieces) contains 1.6 grams of xylitol. Unfortunately, some manufacturers get away with not documenting their product's xylitol content on its packaging. Doing so is not a requirement under U.S. law so, for whatever reason, they choose not to. It's easy to understand why makers of inferior products would want to omit this documentation. After all, they're just after a quick sale to the uninitiated. They don't want you to be able to make a direct comparison between their product and a competitor's because they know if you do they'll loose out. It's not so easy to understand why manufacturers of decent quality products are lax in labeling them. We do feel, however, that these companies deserve to lose the sale too. Daily xylitol consumption needs to be gauged so an optimal level is achieved. And even if you know differently about a product (possibly through a recommendation by your dentist), if another properly labeled alternative exists, choose it. Don't support manufacturers who don't support you by the simple act of providing adequate consumer information. We don't. We don't include mention of any products on our pages unless they provide adequate product labeling. How to pick out the highest quality xylitol products. There are a few different methods you can use to identify, or at least estimate, the xylitol content of a product. For the most part, you'll want to choose those that contain the highest percentage. 1) Look for documentation right on its packaging. Of course, all products should be labeled in a way that clearly states their xylitol content. And it's our opinion that if you find one that's not, out of principle, you shouldn't buy it. With xylitol listed first, this product should make a good choice. 2) Make an estimation based on its ingredient list. In those cases where proper documentation doesn't exist, you can estimate the relative level of xylitol content of products by comparing where it appears in their list of ingredients. In this example, xylitol is positioned further down. That makes this product a less favorable selection. Compounds are arranged in descending order (those found in the highest amounts are listed first). If one product shows xylitol at the head of its list (like Example #1) and competing product (containing similar ingredients) lists it further down (like Example #2), you can assume that the former contains the greater amount of xylitol. Example #3: Xylitol is not only found way down in the list but it's even preceded by another sugar (sorbitol). Compared to the other labels (Examples #1 & 2), it's easy to say that this one makes the worst choice. 3) Look for other sugar-substitutes in the list. Xylitol is a relatively expensive sweetener, especially in comparison to other sugar-alcohols (sorbitol, manitol). If you are comparing two products, and one is formulated with just xylitol whereas the other contains additional sweeteners, it can be assumed that the former will have the higher xylitol content. Keep track of what you usually use. It's good practice to take note of the ingredient list of the product you usually use. Then, in those instances where your favorite brand is not available, all you have to do is look for another that has a very similar looking list (with xylitol shown in an equivalent position). It's a fairly safe assumption to expect that the unfamiliar brand will have a xylitol content that's relatively comparable to the one you usually rely upon. Use one of the menu buttons below to learn more about specific types of xylitol products (chewing gum, toothpaste, oral rinse). I've been using xylitol as a home made mouthwash for years now. I know in the article you couldn't specifically recommend the best quality raw xylitol but could you steer me in the right direction. For example I have been using the product brand "now" and now I need to buy in bulk. Would you say that this is pretty good for my purposes or are there better alternatives. Xylitol is a molecule [(CHOH)3(CH2OH)2] so, as long as the packaging of the products you are looking at say 100% pure, you could consider those products to be equivalent. I did a look at the granulated xylitol products I've purchased (I favor no particular brand. I just look at price.) and did a quick web search. 100% pure products are easy to find, and it seems the general standard for this type of product. On their Nutrition Facts labeling, you should see 4g of carbohydrate (sugars are carbohydrates) and 4g Sugar Alcohol (xylitol is a sugar-alcohol) listed per 1 teaspoon serving. 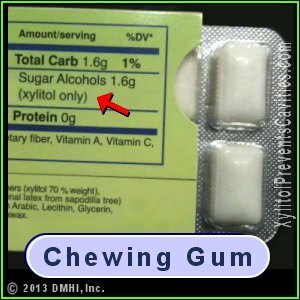 Question: Does Xylitol have equal benefits, if swallowing it (i.e. using it in baking products or as a sugar substitute) vs. using it in chewing gum or lozenges? I'm not sure I understand whether the effectiveness is the same or differs, depending on whether one uses it topically (mouthwash, gum) or in food products that are ingested in baked goods or drinks. Please advise. Thank you! Xylitol has an affect because the bacteria in your mouth that cause cavities have trouble using it as food. So, it's the xylitol exposure that takes place in your mouth (topical exposure) that creates the affect. Once you swallow (ingest) the xylitol, it's no longer helping to prevent cavities. My dentist recommended a xylitol button adhesive to use at night. She could not remember the name. Do you know the name of it and where I can buy it? A product by the name XyliMelts seems to fit your description. We see them on Amazon. The form we saw seemed geared toward preventing mouth dryness. To prevent tooth decay an adult would need to use on the order of 14 buttons of it a day. oral science makes a tablet that "sticks" to the side of the mouth so it doesn't roll around in the mouth. works well! Our follow on your suggestion/recommendation shows that each Xylimelt contains .55 gram of xylitol. That looks like a good product that occupies a unique niche (delivery method). Products that contain xylitol should be clearly labeled, or better yet, banned because it is deadly to dogs. That's a fact! It's highly likely that many dogs have died and will die after consuming a product containing xylitol and their owners didn't have a clue why their beloved pet died. If any dogs have to die as a result of consuming xylitol, they should be the pets of the corporations who profit from its use. Research shows that xylitol is beneficial to the bacteria in human digestive system.